A Cornish district council is to buy a Victorian hospital site to support plans for an extra care village. Caradon District Council has agreed to buy the site of the former Passmore Edwards Hospital on a short-term basis. The move allows housing groups time to put forward proposals without the risk of it being sold to developers. Extra care villages provide housing for older people who need a combination of support but in a way which enables them to live as independently as possible. A number of organisations have expressed an interest in the site. 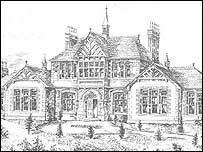 The Victorian Passmore Edwards Hospital is a memorial to Cornish benefactor John Passmore Edwards. He was a Victorian philanthropist born in Cornwall in 1823, who was a journalist, publisher and MP, and remembered as a generous benefactor. He died in 1911. His bequests established more than 70 buildings around the country, including libraries, schools, convalescence homes and art galleries. Liskeard's Passmore Edwards Hospital was built in 1897. People in Liskeard have been fighting to keep the former Passmore Edwards Hospital as they feared it would be knocked down for housing developments. At a meeting in April, Caradon District Council said it wanted to ensure that any development on the site could only go ahead on the condition the original building was preserved.